CLEVELAND — When it comes to Hillary Clinton, some Ohio voters admit to feeling more lukewarm than fired up. Coming off of a surprise loss in Michigan, Clinton is looking ahead to primaries Tuesday in this Rust Belt state and others rich in delegates: Florida, Missouri, Illinois and North Carolina. The Michigan setback has exposed her struggles to energize voters against Bernie Sanders, who’s riding a wave of populist zeal, even as Clinton remains the favorite to win the nomination. Those challenges are evident in Ohio, a pivotal general election state where Democratic voters offered mixed feelings about Clinton and her ability to defeat the Republican candidate should she become the nominee. Lee Apple, 68, of Shaker Heights, who has cast a ballot for Clinton in early voting, expressed disappointment she had no choices to get more excited about, though she described Clinton as “the best option” and said she will volunteer for her. Clinton is favored in Ohio in polling, has offices around the state and has racked up endorsements. 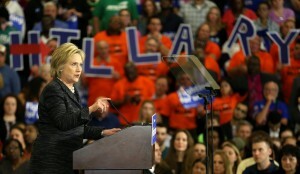 Strong support from older voters and African-Americans may help her in Ohio as it has in earlier contests. Her experience counts to many Democrats. “Probably in my lifetime there has been no other candidate who has the skill set she has,” said Anna Schmidt, 62, of Waterville, another early Clinton voter. But in Michigan, where polling also pointed to a Clinton victory, Sanders managed to energize younger people and liberals and woo working-class white voters with his argument that U.S. trade deals have cost manufacturing jobs. Pushing back, Clinton is stressing job creation and manufacturing at events in Ohio and the other states voting Tuesday. Ohio Rep. Tim Ryan, who is backing Clinton, said he does see excitement, though he acknowledged Clinton cannot match Sanders’ massive and raucous rallies. Delegate math remains on Clinton’s side. She has 762 pledged delegates compared with 549 for Sanders, according to a count by The Associated Press, with 10 delegates from recent primaries to be allocated. If as expected, she wins Florida and North Carolina and does well in the other three states – even if Sanders takes some of them – she will maintain her lead, which is even larger when her lopsided support from party insiders known as superdelegates are added. Barack Obama lost Ohio to Clinton in the 2008 primary race, then won the state comfortably in the November election that made him president. In 2012, Obama managed just to eke out a victory in the general election, campaigning as a savior of Ohio’s auto industry. This year, Republicans badly want to capture the state and will come to Cleveland over the summer for their nominating convention. David Niven, a political science professor at Cincinnati University, said Democrats should be considered “modest favorites” given the makeup of the state. But he said there was an “eat your peas sensibility” to many Clinton voters. “They see this as something they should do and they’re going to do but they’re not necessarily excited about it,” Niven said. In the early contests thus far, Republicans have seen higher turnout in many states than they did in their 2012 primary race, while Democrats are not hitting their record high 2008 turnout numbers. That could be a warning about lack of enthusiasm in November. But former Pennsylvania Gov. Ed Rendell, who is supporting Clinton, argued that primary turnout is not a good gauge of fall excitement. Some Ohio voters aren’t so sure. John Dugan, a 41-year-old bartender from Lakewood, who is voting for Sanders in the primary, said he thinks Clinton can win in November. “With Donald Trump, I feel he is so divisive, I think she can win with name recognition alone,” he said.